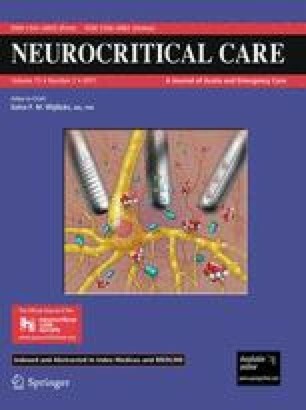 Delayed cerebral ischemia occurs in about 30% of patients during the first 2 weeks after subarachnoid hemorrhage, and can result in substantial disability and death. Research studies investigating the incidence of delayed cerebral ischemia and strategies for prevention and treatment are hampered by inconsistent use of terminology and definitions for this complication, and by reliance on indirect surrogate markers of ischemia. A literature review was conducted to search for studies that addressed the issue of inconsistent definitions of delayed cerebral ischemia through December 2010. A total of four studies were identified. Original research studies and consensus panel recommendations for definitions support limiting the use of combined measures that include both clinical and radiographic assessments, as well as indirect measures, and the current usage of the term vasospasm. Cerebral infarction was supported as the most appropriate definition for delayed cerebral ischemia in the context of clinical trials. The Participants in the International Multi-disciplinary Consensus Conference: Michael N. Diringer, Thomas P. Bleck, Nicolas Bruder, E. Sander Connolly, Jr., Giuseppe Citerio, Daryl Gress, Daniel Hanggi, J. Claude Hemphill, III, MAS, Brian Hoh, Giuseppe Lanzino, Peter Le Roux, David Menon, Alejandro Rabinstein, Erich Schmutzhard, Lori Shutter, Nino Stocchetti, Jose Suarez, Miriam Treggiari, MY Tseng, Mervyn D. I. Vergouwen, Paul Vespa, Stephan Wolf, Gregory J. Zipfel.